Variations in crown, root and root canal anatomy are found in all groups of teeth. Various external tooth morphological signs such as cervical width, supernumerary cusp, palato-gingival groove, wider mesio-distal dimensions of the cusp/tooth should be taken into consideration to predict the presence of any additional root. Concomitant occurrence of supernumerary cusps such as the parastyle, central cusps and variations in root features in maxillary molars has not been discussed in the literature. Formation supradentalis is a condition in which molar has an extra cusp along with a supernumerary root. The aim of this case report was to describe the diagnosis and endodontic management of a maxillary right first molar with formation supradentalis. A 38-year-old healthy Asian woman reported to the department with a continuous severe pain in the right posterior maxillary region for three days. Clinical examination revealed a carious right maxillary first molar (tooth #16) with a dislodged restoration. The crown of the tooth #16 was wide palatally with a paramolar cusp present between the mesio-palatal and disto-palatal cusps [Figure 1]. It was tender to percussion without any evidence of mobility, swelling or sinus tract. Cold test with CO 2 ice stick and electric pulp test elicited the premature, intense and lingering pain response. Pre-operative radiographic examination revealed an occlusal radiopacity suggestive of a previous restoration, mesio-occlusal radiolucency below restoration involving the pulp and widened periodontal ligament space with respect to mesio-palatal root [Figure 2]. From the clinical and radiographic findings, a diagnosis of irreversible pulpitis with symptomatic acute apical periodontitis was made. Radiographic examination revealed presence of mesio-palatal and disto-palatal roots in relation tooth #16. The patient was explained regarding the need for an endodontic intervention and variation in the usual coronal and radicular anatomy. Written informed consent was taken. Under rubber dam (Hygienic, Coltène Whaledent Inc, USA) isolation, rectangular access opening was made in tooth #16 and working length was determined with an electronic apex locator (Root ZX; Morita, Tokyo, Japan) and radiographic method. All canals were prepared using Protaper NiTi rotary instruments (Dentsply Maillefer, Ballaigues, Switzerland) according to manufacturer's recommendations with standard irrigation protocol. Intracanal dressing of calcium hydroxide (Prime Dental Products Pvt Ltd, Mumbai, India) was given for two weeks during which #16 was asymptomatic. Obturation was done by a single cone technique with the help of gutta-percha cones and epoxy resin-based root canal sealer (AH plus sealer, Dentsply Maillefer, Tulsa, OK). 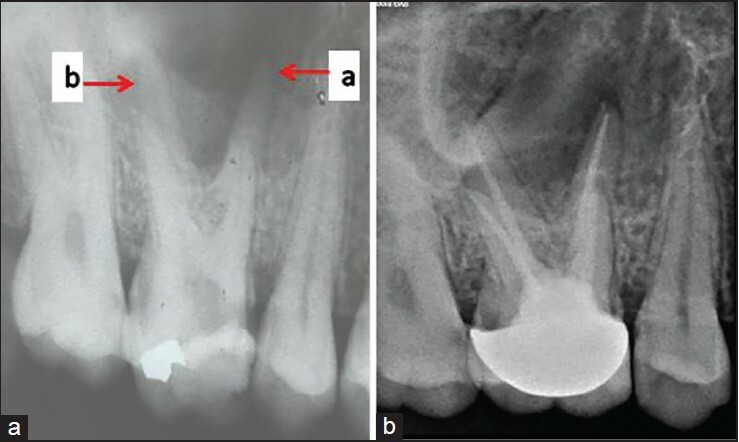 Tooth was restored with a posterior composite restoration (Z250, 3M Dental Products, St. Paul, Minn.) and porcelain fused to metal crown was placed [Figure 2]. The present case report highlights the endodontic management of maxillary right first molar (tooth #16) with formation supradentalis. A paramolar cusp is a non metric dental trait expressed as a style or cusp of supernumerary character on the buccal or lingual surfaces of premolars or molars and develops from secondary enamel knots. Also, there is increased likelihood of a paramolar root when the paramolar cusp is well developed. Hence, in tooth #16 showed a well-lobulated palatal paramolar cusp, which increased the chances of presence of a supernumerary palatal root. Tooth #16 exhibited four palatal cusps in the same palatal plane - prominent cusp of Carabelli and a paramolar cusp along with mesio-palatal and disto-palatal cusps and a supernumerary palatal root. Thus, it was classified as unilateral formation-supradentalis with the presence of six cusps and four roots. Angulated pre-operative peri-apical radiographs are indispensable in ruling out the presence of any unusual morphology. An attempt to reduce the required number of radiographs and any pre-determined assumption about the root canal morphology increases the risk of missing the information of root canal morphology. A careful tracing of periodontal ligament space can suggest the presence of an additional root. Certain additional operative steps are to be followed to visualize the elusive canal anatomy. This includes coronal flaring of the canal orifice, white and red line tests, troughing of grooves with ultrasonic tips, examination of the pulp chamber floor with a sharp explorer (DG 16), champagne bubble test using sodium hypochlorite, use of dyes like 1% methylene blue etc. Also the use of loupes and operating microscopes aid in locating such canals. The coronal morphology of tooth may be indicative of radicular aberration. To determine the presence of an additional root or root canal, a thorough knowledge about the external tooth morphology, careful interpretation of pre-operative radiographs and detailed exploration of internal root canal anatomy are critical. 1. Raju CR, Chandrasekhar V, Singh CV, Pasari S. Maxillary molar with two palatal roots: Two case reports. J Conserv Dent 2010;13:58-61. 2. Kallay J. Extra cusp formation in the human dentition. J Dent Res 1966;45:1381-94. 3. Thesleff I, Keranen S, Jernvall J. Enamel knots as signaling centers linking tooth morphogenesis and odontoblast differentiation. Adv Dent Res 2001;15:14-28. 4. Gopikrishna V, Bhargavi N, Kandaswamy D. Endodontic management of a maxillary first molar with a single root and a single canal diagnosed with the aid of Spiral CT: A case report. J Endod 2006;32:687-91. 5. Jadhav GR. Endodontic management of a two rooted, three canaled mandibular canine with a fractured instrument. J Conserv Dent 2014;17:192-5.